A cough headache is an unusual type of headache that is triggered by coughing and other types of strain such as sneezing, crying, laughing, bending over or having a bowel movement. Doctors distinguish cough headaches into two categories. Primary cough headaches are usually harmless and occur in limited episodes, thus eventually improving on their own. On the other hand, secondary cough headaches are more severe as they may be caused by problems within one's brain. Treatment for secondary cough headaches may require surgery. What are the symptoms of cough headaches? Primary cough headache symptoms include: • Starts suddenly along with coughing or just after coughing or any other type of straining. • Last a few seconds to a few minutes whereas some can even last up to 30 minutes. • They cause sharp, stabbing, or splitting pain. • Generally affects both sides of one's head and are typically worse in the back of the head. Secondary cough headache symptoms include: • They are long lasting headaches • They cause dizziness, unsteadiness, and fainting. What causes cough headaches? The cause for a primary cough headache isn't clear. It could be due to an increased pressure in the head that is caused by coughing and other types of straining. Whereas, secondary cough headaches may be caused by a defect in the shape of one's skull or cerebellum, weakness in one of the blood vessels in the brain or a brain tumor. What are the preventive measures for cough headaches? These include: • Getting an annual flu shot • Treating lung infections such as bronchitis • Using stool softeners to avoid constipation • Avoiding medications that cause coughing as a side effect • Curtail heavy lifting or bending for long periods The treatment for cough headaches usually depends on whether you have primary or secondary cough headaches. 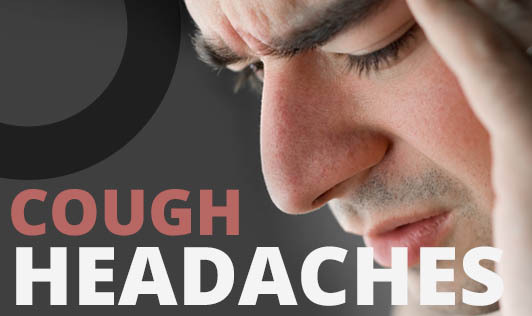 Seek medical assistance if you experience sudden severe headaches after coughing or if you have any other troubling signs or symptoms such as double or blurred vision.